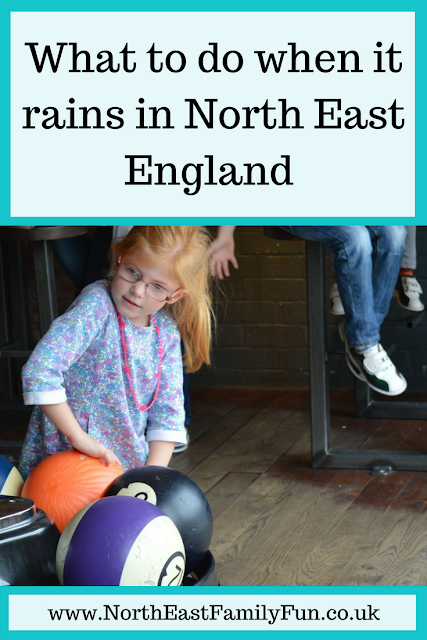 Living in the North East, you can always count on one thing - you're never too far from a rain shower. It doesn't matter what season it is, there's always going to be rain at some point. Sometimes we like to embrace the rain, pop on our wellies and go out for a walk and other times we like to hibernate and have a day at home baking and watching movies. 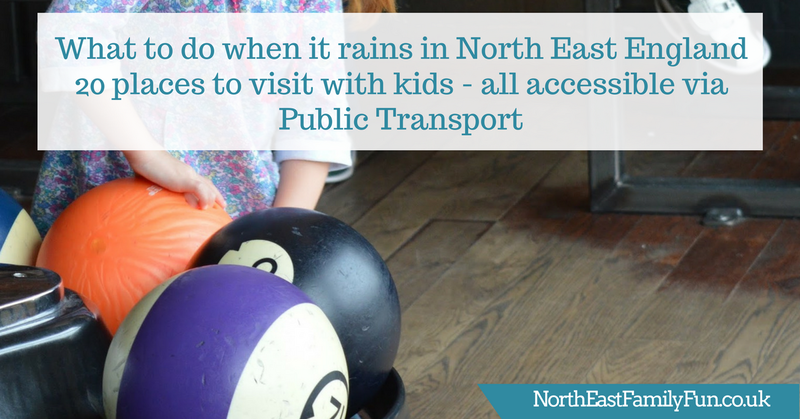 There are times when I can't stand to be in the house a second longer - especially during those weekends where it rains non-stop so today I thought I'd share 20 places to visit with the kids when it rains and they're all accessible via public transport too. Let us know in the comments if there's anywhere you'd add to the list. The Discovery Museum is a free-to-visit attraction in Newcastle City Centre. There's lots for families to enjoy from the Newcastle Story exhibition where you can walk through the toon through the decades to lots of fun interactive and temporary exhibitions too. How to get there: The Museum is a 5-minute walk from Newcastle Central Station (trains, bus and metro). The Family Activity Centre is a fantastic place for kids to let off some steam. From basketball to cargo nets, ninja warrior, bouncy castles, trampolines and battle beams - there's loads to do. There's a nice mezzanine cafe area where grown-ups can enjoy a coffee and watch the action too. Cost: £10 for children aged 4+ / £5 for children aged under 4. The Word in South Shields is a fantastic FREE attraction just by South Shields Market Place and Ferry Terminal. There are permanent engaging exhibitions, hands-on fun with tablets around the building, glorious views of the Mouth of the Tyne (with binoculars you can try), lots and lots of books to read, interactive displays and regular additional activities too. Don't miss the LEGO Metro Train at the entrance. How to get there: Via Bus, Metro or Ferry. South Shields Museum is a fantastic free-to-visit Museum in the heart of the town. Just a short walk from the metro station, you'll find interesting permanent and temporary exhibitions and special events. Don't miss the history of South Tyneside and Creature Corner featuring live reptiles and small animals. From Rays to Clownfish, Otters, Seals and Marmasets, there's a lot to see and do at Blue Reef Aquarium and you can come and go as you please throughout the day - perfect for ducking inside if you're visiting the beach during a day of sunshine and showers. There are regular animal talks and feeds throughout the day - don't miss the sharks! The Great North Museum is a free-to-visit attraction in the heart of Newcastle. Permanent exhibitions include a real Mummy, a replica of Hadrian's Wall, Ancient Greeks and Fossils. There are changing temporary exhibitions on the top floor providing a new reason to visit plus a Planetarium and a fantastic free/low-cost events programme. Clip n Climb in Concordia Leisure Centre in Cramlington features dozens of climbing challenges and experiences. No previous experience is required as a full training and safety briefing is provided. Tackle the Lightning Crack, take on your friends and challenge them to a head to head race or try the Leap of Faith. There's a bowling alley, soft play and swimming pool in the centre too if you want to make a day of it. Visit Wallace the Lion, the first Nissan Car to be produced in Sunderland and take in the ship-building galleries in the museum before enjoying over 2000 plants in Sunderland Winter Gardens. There's always something going on at Life Science Centre for all ages and its location is perfect if you're travelling by train or metro. From the experiment and curiosity zone to science shows and a planetarium. It's difficult to get bored here! A bit of rain doesn't stop the crazy golf at Mr Mulligan's as it's all indoors. Choose from three Space themed Golf adventures (or try them all). Mr Mulligan's is right next to the Gate so perfect to combine with a cinema trip or a bite to eat. The Tyneside Cinema is the last operating News Theatre still operating as a Cinema today. This independent cinema runs lots of events for families from a popular egg and spoon club at their bar cafe in the holidays (complete with classic cartoons) to Bringing in Baby Screenings and a Children's Film Club. Swimming is a fab choice for a rainy day and Wet n Wild with its flumes, slides, lazy rivers and wave pools is somewhere you can definitely spend the full day and get your money's worth. The Dunes in South Shields is an indoor complex featuring lots of fun. There's a giant 5-level soft play, bowling alleys, arcade, bar and popular Sunday Carvery. Lots to keep children of all ages entertained. The Baltic and the Sage on Gateshead Quays are both free to visit and next door to each other so perfect to combine on a rainy day in the toon. Kids will love exploring the various galleries and exhibits at the Baltic and the fantastic views from the viewing platform and lifts. The Sage is home to a nice little cafe and small play area that's free to use too. You'll find Bailiffgate Museum in the heart of Alnwick. There are toy and local history exhibitions as well as regular special events and activities too. Seven Stories is the National Centre for Children's Books and something we are so lucky to have on our doorstep here in the North East. The seven-story building is packed with hands-on exhibitions based on children's books, lots of books and interactive activities, craft areas, storytelling sessions, dress-up opportunities and plenty of opportunities to discover new books. Segedunum Roman Fort is super easy to get to via Public Transport as it is right next door to both Wallsend Bus and Metro Station. Inside you'll find lots of Roman facts and hands-on fun. There's a fantastic viewing tower with glorious views over the Tyne and fort. The entrance fee is definitely worth a visit. The Thought Foundation in Birtly, Gateshead is a place where creativity and play are both encouraged and nurtured. There are galleries and exhibitions, a calendar of special events, a play zone and imagination station for ages 0-5 years, a fab community cafe serving healthy food and a gift shop selling unique and beautiful items. The Thought Foundation is a lovely place to provoke thought and inspire. Barter Books is one of the UK's largest second-hand bookshops and a fantastic place to hide away on a rainy day. Enjoy a hot chocolate and biscuits by the roaring fire or something more substantial in the station cafe, browse the vast collection of children's books, barter your old books for new and watch as a toy train travels around the ceiling. Lane 7 is our favourite bowling alley in the North East. It's trendy and also home to crazy golf, ping pong and karaoke too so lots to fill your day! The food is cracking too. Museum's are a godsend when it's raining! You seem to have quite a few interesting ones around there! Great selection, popped on to look for somewhere to go in this terrible weather. Thanks!